Fresh Class A seasoned and basted whole chicken. Without giblets. From Trusted Farms Cook up an easy roast any day of the week. 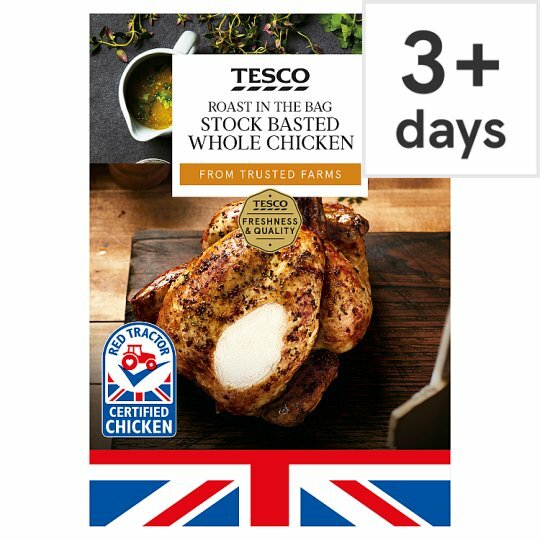 Our roast in the bag whole chicken is oven ready and seals in flavour for perfect results. This succulent centrepiece is seasoned with thyme and parsley and basted in chicken stock for a flavoursome, hassle free family meal. Just place in the oven and follow the simple cooking instructions. For a crispy skin, baste with the cooking juices after opening the bag. Return to the oven and cook for a further 5 to 10 minutes. Serve with tasty trimmings like our Sticky Chantenay carrots and parsnips recipe. Click the Recipes tab at the top of this page to find our side dish recipes. From trusted farms. Our chickens are reared by selected farmers in spacious barns with daylight and bales to encourage natural behaviours and ensure their wellbeing. INGREDIENTS: Chicken (93%), Water, Chicken Extract, Cornflour, Sea Salt, Black Pepper, Dried Red Pepper, Parsley, Thyme, Sunflower Oil. Instructions: Place chicken in ovenable bag into a deep roasting tin (approx. 5cm deep). Cook for 1 hour 5 mins on the middle shelf. Remove from oven, place on a heatproof flat surface and open the bag carefully by slitting down the front of the bag with scissors. Baste the chicken with the cooking juices and return to the oven for 20 mins. Remove from the oven, cover with foil and rest for 10 minutes before serving. This product is fully prepared and can be cooked in its packaging. For best results, we recommend cooking in the bag. Do not pierce or open before cooking. CautionMake sure the bag does not touch the oven walls, shelves or heating element. Take extra care when opening the bag as steam will escape and the bag will be full of hot cooking juices. The bag may open during cooking and result in cooking juices to seep from the foil tray into the roasting tin.